Congratulations to Georgia Institute of Technology (also known as Georgia Tech), for winning the Green Cleaning Award for Schools & University Grand Prize in the higher education category. Georgia Tech was an early adapter of ionized water, and has been paving the way for schools all over the nation to reduce reliance on chemicals ever since. This Atlanta, GA-based university encompasses 7 million square feet of facility space and has an annual budget to match, at $7 million. That budget does not pay hefty sums to purchase chemicals anymore, because at least 90 percent of the entire university campus is chemical free, according to Tommy Little, associate director of building services at Georgia Tech. In 2009, when the university started experimenting with some of the earliest versions of activated water on the market, a commitment to starting small with a pilot program and using thorough, hands-on training, was key. “When we transitioned, we had to change the whole culture and the mindset of our employees,” recalls Little. What the school did was organize a zone approach to cleaning, which slowly introduced the new technology and took a thorough and systematic overhaul of its training program. Activated water was a brand-new technology when Georgia Tech started using it in 2009, but today it’s gaining traction and attention for its combination of green properties and effectiveness. A variety of machines are available from leading cleaning equipment manufacturers that convert tap water into a cleaning agent, without the use of any chemicals at all. The scientific process by which the water is converted differs based on the type of equipment. To learn more about activated water and where to look for equipment, download Step 3 of the 5 Steps to Green Cleaning in Schools. 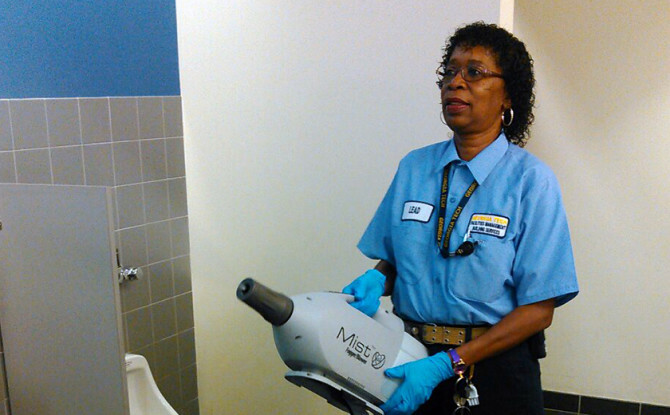 Today the cleaning staff at Georgia Tech uses activated water for all of its general cleaning needs, including window cleaning, spot cleaning carpet stains, and as an effective method for keeping whiteboards sparkling clean. The one surface that has had the largest impact is the use of activated water on all floors throughout the building, which make up the most significant amount of surface area in any school system. They’ve also moved toward using equipment that combines pads and scrubbers to strip floors without the use of harsh chemicals. As an early adapter of activated water as a cleaning technology, Little and his team didn’t have examples set by other schools to follow in their pilot program or to help make the case to administration for making a change. Fortunately, money talked from the get-go. According to Little, cost benefits emerged three to six months after the purchase of the first set of activated water equipment. “The savings accumulated by not purchasing chemicals was the biggest convincer,” said Little. He made a strong case for investing in green cleaning technology that reduced dependency on chemicals by comparing purchasing price from previous years. Today, Little is hoping that his experiences can help pave the way for other schools. As a member of the Green Clean Schools Leadership Council, Little serves as a mentor to facilities directors at schools across the country, helping them to make greener, healthier choices like those he pioneered nine years ago. Little was a presenter at the Green Clean Schools Leadership Summit in July of 2015, and spoke about how his staff uses activated water. After that talk, many other schools in the Southeast as well as across the country and even Canada have reached out to Little with questions about activated water. They’ve asked him for guidance on how to sell the switch to the larger school community, shared cost-related concerns and asked him how to gain buy-in from staff. His overarching advice? “Don’t try to do it overnight.” Georgia Tech’s pilot program was a key period during which cleaning staff was able to learn by trial and error, and test results. Now that Georgia Tech has its second Green Cleaning Award (their first win was an honorable mention in 2007) under its belt, the school is looking for more ways to strengthen its green cleaning program and galvanize the rest of the school community. They published a comprehensive manual, which outlines the university’s detailed green cleaning program in an effort to standardize their processes. Not only is the manual a useful tool for training new hires, but design and construction staff use it to get LEED points from the USGBC. Most recently, the school sought and attained Green Seal certification.